Continuing his mission to unite rugby and sailing communities as he races round the world, former England Sevens Captain Ollie Phillips wasted no time getting back into rugby business when he arrived in Singapore for the end of Race 8 of the Clipper Race. 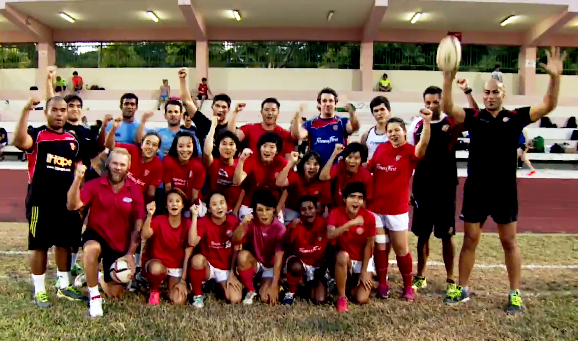 Singapore is a nation with high ambitions to become the international hub for rugby in Asia. 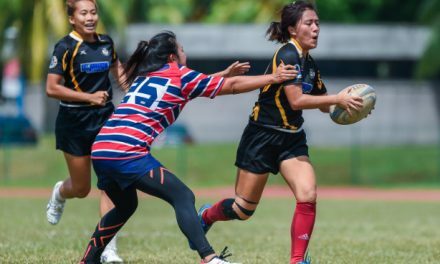 As well as competing in the South East Asia (S.E.A) Games next year, the country has bids in place to host both the Sevens World Series in 2015 and the 2018 World Cup Sevens tournaments. After meeting Sir Robin Knox-Johnston at the British High Commission reception and hearing all about the Clipper Race and Ollie Phillips’ participation, SRU Technical Director, Inoke Afeaki, came to One15 Marina to personally welcome Ollie to dry land when he arrived on GREAT Britain, and invite him to be a guest coach at national team training. Following his session, later that same day with the women’s team, whose 15’s squad are currently ranked third in Asia, Ollie Phillips said: “It was a great pleasure to arrive here in Singapore, a place that has an exciting rugby future and be given the opportunity to meet and coach the Singapore players. “Their standard of rugby was actually a lot better than I had prepared myself for. I thought the sessions went very well and it certainly felt very good to be back on land and also back on the pitch. Later in the week, after being invited to view Ollie’s GREAT Britain boat, former Tonga international, Inoke Afeaki commented: “We’ve all been very impressed with Ollie. He has been generous with his time here in Singapore and has been able to teach us some valuable lessons. As an experienced player who knows the game very well from many levels, we greatly appreciated his insights. Since he was handed over to the Clipper Race by the England Rugby Sevens team at London’s Race Start in August 2013, Ollie has been involved in a number of international rugby projects during his Clipper Race stopovers. In Rio de Janiero, Ollie joined up with the Rio 2016 Olympic Organising Committee’s Education Department to take Brazilian kids in their first ever rugby lesson; in Cape Town, he joined the Springboks for a training session and in Australia, he took the Waratahs team for their first ever sailing lesson in Sydney Harbour. Once he completes the Clipper 2013-14 Race in July 2014, Ollie hopes to re-join the national rugby team and hopes to play in the first Rugby 7’s at the 2016 Rio Olympics, where he plans to end his playing career. Ollie’s international rugby experiences will feature in the Clipper Race documentary which comes out at the end of the race, though you can watch a brief preview video of his experience in Singapore HERE.